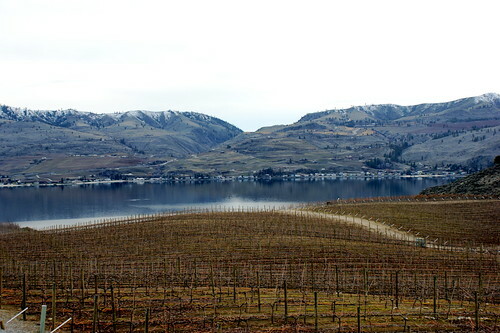 My husband and I went for a long weekend at Lake Chelan in Washington. It’s the shoulder season so the lake was low, the sky overcast and the vast orchards and vineyards bare. However, we had a great time. We did a little cross-country skiing on the last snow of the season at the Echo Ridge Nordic Ski Area which luckily was just up high enough that the trails were open. It was literally bare dirt all the way up the hill until, suddenly, snow! Then we availed ourselves of the many wineries in the area and had a fantastic time. Cabernet! Viognier! Gewurztraminer! They grow a huge variety of grapes here and are very excited about the new Columbia Valley AVA designation. 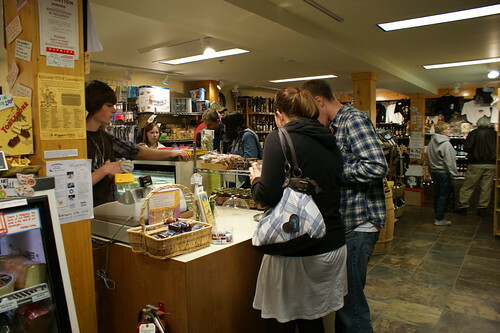 To get there, we drove up near Seattle on I-5 and then over, passing through the little Bavarian town of Leavenworth. Did I say Bavarian? Yes, I did. Sometime in the 1960s in an attempt to save their town from financial ruin, some enterprising folks decided that Leavenworth could become a destination. They invented the Bavarian concept and ran with it — all the places on main street are tarted up like hearty Alpine Volkesmarchers with Willkommen! signs and gingerbread filigree and excellent murals. However, they managed to stay just this side of a total Disneyland spectacle and we were pretty charmed by the ingenuity of it all. On the way into town, I googled up some recommended places to eat and to see if they had a cheese shop. I wouldn’t be writing this post if they didn’t! 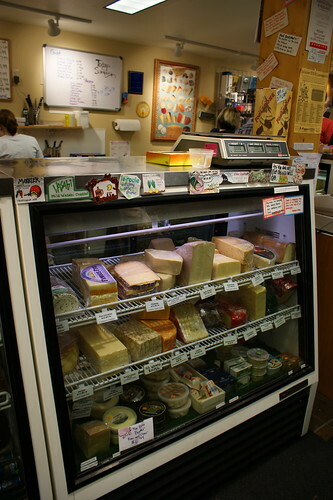 The Cheesemonger’s Shop promised Bavarian cheeses, beer and wine. It was crowded with people and had a fairly good selection. If you’re looking for some cheeses for your après-ski fondue pot then you have come to the right place. However, I was looking for Washington or local cheeses. Unfortunately, I don’t think there are too many cheese makers in this area of the state. I was steered toward some Oregon and California cheeses which were, of course, delicious but didn’t satisfy my craving for local. I think this is just not quite that kind of cheese shop. 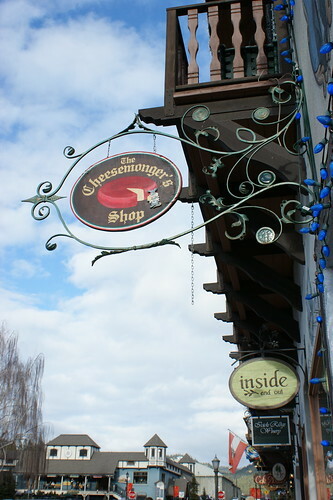 Tragically, there were no cheese shops in Lake Chelan…while we were there. On our last day, we noticed a brand new sign in a window that read: “Coming Soon! Handcrafted and Artisan Cheeses! May 2010!” So, there you go. Perhaps next time we go to the lake, we’ll swim in it, get a tan and gobble up some artisan cheeses. If anyone in the area knows more about this future cheese shop, please let me know! Click here to see how we plated our Leavenworth bounty. I would also recommend hitting up the Pasek Cellars wine tasting shop at 939 Front Street. We wandered in there today and for $2 you can taste 5 or 6 different wines. Maybe more if you’re pushy! They waive the charge if you buy a bottle. Exceptional value if you want to get warmed up before downing some Humboldt Fog!